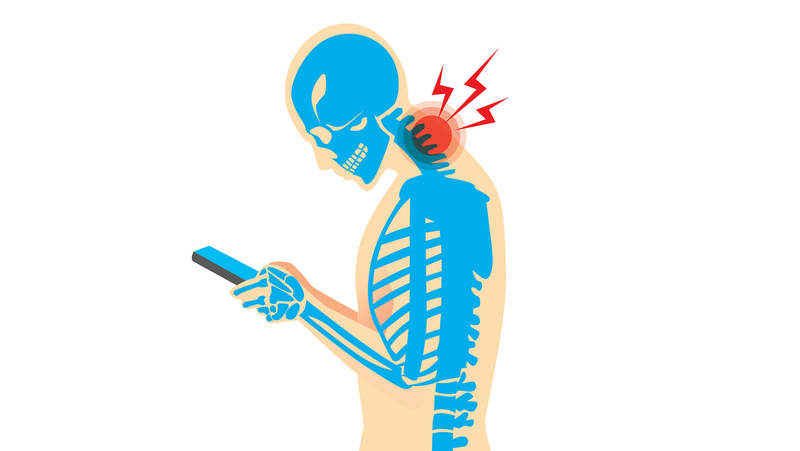 Text neck is a Modern age term coined to describe repeated stress injury and pain in the neck resulting from excessive watching or texting on hand held devices over a sustained period of time. It is also often known as Turtle Neck posture. It is a cause for increasing concern especially with children given their greater propensity to mobile phone usage. Recent figures have shown that around 87% of teenagers (14-18 years) in USA and 79% teenagers (12-15 years) in UK own and use smartphones. Among adults 92% and 95% (18-34 years) reported owing a smartphone in USA and Australia respectively. The term ‘Text Neck’ was coined by Dr. DL Fishman, a US chiropractor.This condition is a growing lifestyle and health condition with the constant growth in mobile user population all over the world. Apart from neck pain, it can also cause shoulder pain, upper back pain, headaches and increased thoracic kyphosis. Flexing the head forward to use a smartphone affects the spine directly. Tilting the head forward to 15 degrees places about 27 pounds of force on the neck. This increases to 40 pounds at 30 degrees, 49 pounds at 45 degrees and 60 pounds at 60 degrees. Damage caused by untreated text neck can be similar to occupational overuse syndrome or repetitive stress/strain injury. Radiating pain: there can often be radiation of pain into the shoulders and arms. Headache: sub-occipital muscle tightness can lead to tension type headaches. Rehabilitation is found to be very effective in treating the stress injury resulting from Text Neck. Rehabilitation can be designed as a 2-4 week program starting with soft tissue mobilization, Grade 1 and 2 joint mobilization, active and passive stretches of tight muscles and progressing to muscle strengthening, posture retraining and home exercise program. In extreme chronic cases pain medication, injection into the facet joint or trigger point or acupuncture can be done.